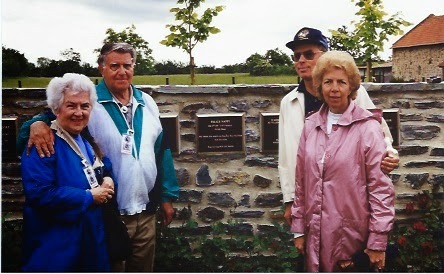 Fifteen years ago today, my husband and I stood at the Wall of Remembrance in France with my Mother and Father. Months before the planned trip to celebrate the 55th Anniversary of D-Day, my husband ordered a plaque to be placed on the wall in my Father's honor. He was among the brave men who walked onto Omaha Beach seventy years ago to fight for the freedoms we hold dear. We will always remember. 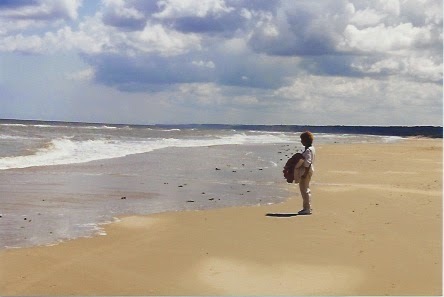 I got to stand on that now calm, peaceful beach and look out into the endless horizon, trying to imagine what it must have been like that day. He has recounted the story many times - always with a note of humor underlying the harsh reality of those awful moments - making it palpable for tender hearts. We visited the cemetery - row upon row of perfectly aligned crosses marking the place where young dreams died and courage lives. 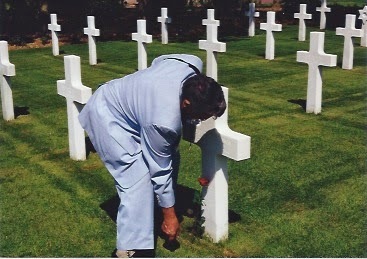 We watched with pride and gratitude as Dad placed roses on the graves of those he knew by name - the ones who became his brothers - the ones who never made it home. I saw him wipe away tears. I sat with chills, silent, when I finished reading this, Linda. Thank you for sharing his story, which is your story, too, and all of ours. 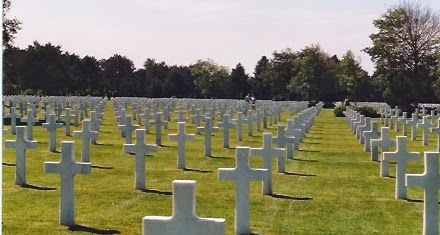 So many sacrifices made, that we could live in freedom today. I heard today that 33 pairs of brothers died on the beach as well as a father and his son. I've been to Pearl Harbor. Seen the oil that still bubbles from the wreckage of the USS Arizona where 23 pairs of brothers as well as a father and son died. I've sat on a bench near the harbor and tried to imagine what it was like. Amazing. Please thank your dad, from the Hunter family, for his faithful, sacrificial service to our country. Thank you so much for sharing this, Linda. Sending love and prayers. Great gratitude for their sacrifice. You've written it well. there ought to be a "," after "gave"
~ Love to you and yours, miss Linda.